The guitar fretboard is a very mysterious and complex playground, no doubt about it. The movies on this page show you a variety of ways of playing the very same thing, in this case the most elementary scale there is: the C major scale, all the natural notes. It can be very discouraging to a beginner to find out that there are countless things to learn in countless positions. Don't let it overwhelm you, though. Just because there are countless ways to play any given chunk of music doesn't mean you have to know them all down pat. There are certain positions that work best and these are the ones you will be playing most often, so over time, practice and learn them. It takes a long time for the layout of the fretboard to make sense, but it will if you keep playing, exploring and experimenting. Scales are a great way to get your fingers working properly, to learn how to move from string to string smoothly, to coordinate the picking hand with the fretting hand, but don't become obsessed with learning every last mode at breakneck speed. There is a saying that goes "if you practice scales, you'll wind up playing scales" and music is more than scales. Scales are in fact the breeding ground of much more useful musical entities, namely chords, and this is where I recommend you invest your practice time. By knowing as much as you can about chords, you'll be learning all about scales without even knowing it. 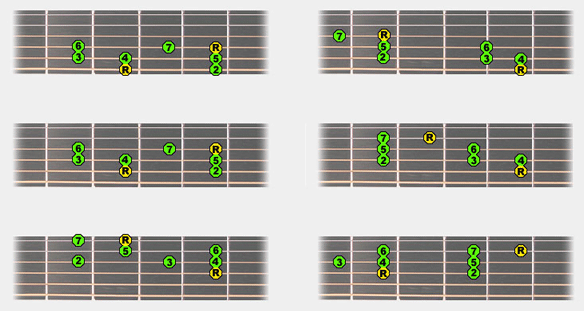 Here is a look at how the major scale looks on a fretboard. Unlike keyboard instruments, where there is just one of each note, the guitar has multiple positions for most notes. It stands to reason that if there are multiple positions for any a note, you will also find multiple positions for any melody line or chord or scale. In the video above you can see and hear me play the C Major Scale in various positions which I've numbered 1 to 8 and I've commented on them below. 1 - I start out by playing the C scale on one string. This is something you will probably never do, but it is the best way to show you the formula for the major scale that you should commit to memory: Tone Tone semitione, Tone Tone Tone semitone. You'll be able to see that graphically, right on the fretboard when I finish playing it. Remember that a tone is two frets, a semitone is one fret. I've made the roots — the C notes — blue. This is by far the most impractical way of playing the scale, or anything else, on a guitar. 2 - This is how to play the C scale down near the nut, using open strings as they become available. Notice that I start on the same root as (1), but that I then move to the open D string for the second note. Since the C scale is C D E F G A B, there are two other open strings that can be used, the G and B stings. That end note is the same C as the one way up the neck in version (1). 3 - Here I'm starting on the same root, but I'm finding subsequent notes on the 'other side' of the root than version (2). I don't use any open strings in this version. Once again, that end root is the same note as in version (1) and (2) but in yet a new position. This pattern is a very comfortable and compact and is moveable, in other words you can start the pattern up one fret on C# and play a C# scale; move it down one fret, and you'll be playing the B scale. This is a good one to learn. 4 - Now I moved the root to the sixth string. A C on that string is found at the 8th fret. Remember though, this is the same pitch as the root I used in (1), (2) and (3). I'm working 'to the left of the root' to find the rest of my scale notes and you can see that I end on the same B and C notes as pattern (3). As with all these patterns, it's moveable. 5 - I start on the same sixth string position for the root, but now I'm playing the scale on 'the other side'. If you're observant, you'll see that this pattern is identical to (2), but played on strings 4-5-6 instead of 3-4-5. 6 - I start on the fifth string, move to the fourth string as in pattern (3), but instead of moving to the third string for the last three notes, I carry on up the fourth string. This is a spread out pattern, but it's still the C Major scale, same notes, same chunk of music as all the others. 7 - Here I've started on the sixth string, kept going on it for the next three notes, moved to the fifth for two notes, ended on the same two positions as version (6). Again, a spread out, impractical way of playing it. 8 - I end this demo by playing up through two octaves of the scale, then back down using a different path. You'll see that the first octave is pattern 5 and that I keep going through strings 3-2-1 until I come to the next root, then I head down the scale on the first string and when I hit the root down near the nut, I'm back into pattern (2) —the open-string pattern — I keep going down past the low root until I can go no further (the open E string), then back up and end on the fifth string root. So there you go ... complicated enough for you? I does seem awfully tricky, doesn't it? And I've only shown you a few here! There many more ways to play any given scale. Don't worry, you will come to grips with this maze of possibilities. Below are some major scale patterns that you can twang away on. These can all be moved up or down the fretboard (meaning right or left in these images) and whatever note you start on will name the scale. The numbers indicate the scale degree for each note. R stands for Root, which can be seen as either 1 or 8. Two start on the 6th string, two on the 5th and the other two on the 4th string. Once again, there is no reason whatsoever to pull your hair out over this. Scales are good to know about and you will eventually come to terms with them all. The best thing about scales, especially this one, the Major Scale, is that from it come the most useful and powerful musical entities of all: chords. But before we get onto that topic, lets just see what other kinds of scales there are.